View Heatmap that has not captured the screenshot correctly. Click the Heatmap Help link. This link can be found at the bottom left-hand side of the Heatmap. Choose which devices need to have the screenshot retaken. All three devices can be retaken at one time. The retake screenshot tool will not open when the button is clicked if third-party scripts are disabled. If this is the case, reach out to our Support team directly to retake the screenshot. Follow the prompt and click the camera button. Clicking the camera button will take the screenshot. 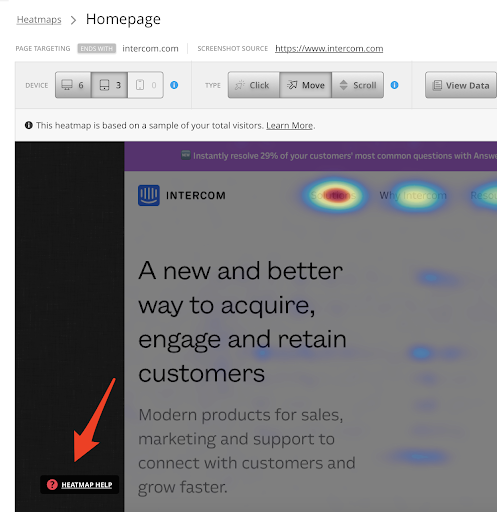 A pop up will then appear, guiding you back to the Heatmap dashboard. Wait for your screenshot to process. 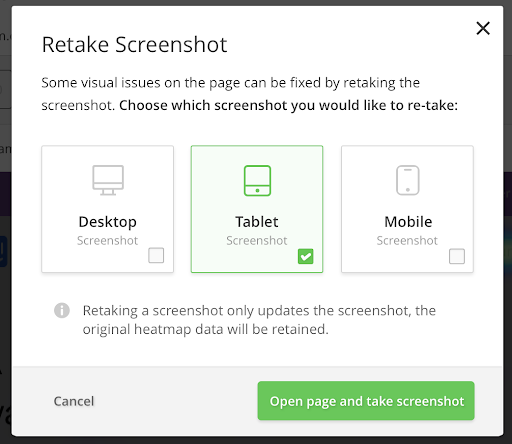 Let our retake screenshot tool know if it fixed the screenshot.